One of my favorite things about summer is a great cookout. Living in the Midwest, our grilling season is so short and sweet, we have to savor every moment. 4th of July is a perfect occasion to invite friends and family over for a gathering! While burgers and hot dogs are great, it’s nice to switch it up sometimes with a new recipe. 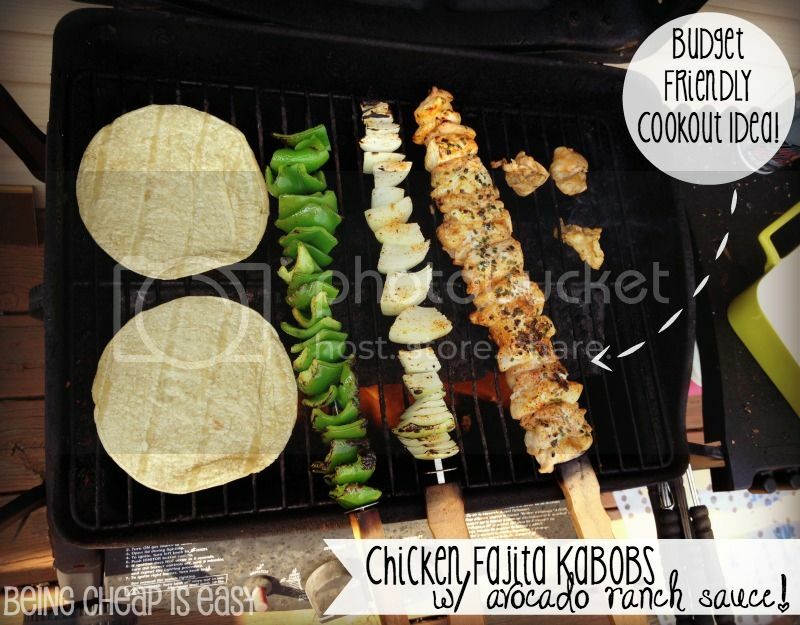 These Chicken Fajita Kabobs are budget-friendly since they’re filled mostly with veggies, not meat. You can cater them to your tastes and add whatever you would like: steak, zucchini, hot peppers. This is a great option if you have vegetarian friends too! Simply make veggie kabobs and be sure to grill them on their own foil-lined pan. This chipotle lime marinade adds a big flavor punch to the chicken and you won’t believe how simple it is! 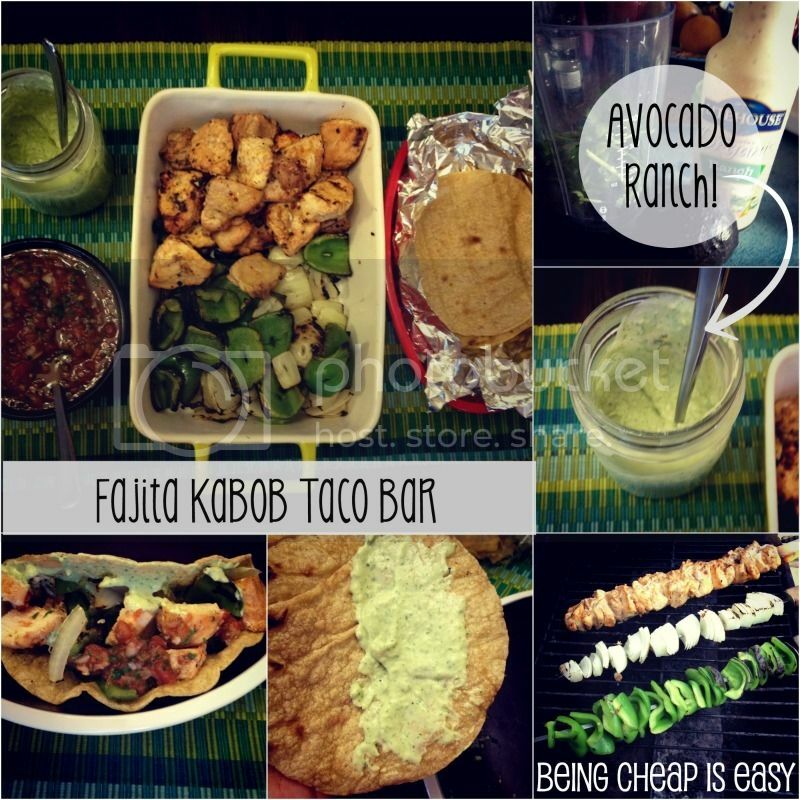 Another great addition to the taco bar is the avocado ranch to cool down the slight spiciness of the chicken. This taco bar is quite simple. If you’re having a larger party, have people bring their favorite chips and salsa for a great variety, or have a BYO craft beer bucket. My go-to pantry salsa is always a hit! We love to have a big bowl of guacamole, cheese, lettuce, tomatoes, pickled radishes, corn tortillas, sour cream and hot sauce. The newest addition is this avocado ranch dressing—which is super tasty on taco salads, too! In a blender, put in all ingredients and mix until smooth. For a spicier sauce, add 3-4 shakes of hot sauce. Chill in fridge until ready to use. Most items for this taco bar can be done ahead of time, so you can enjoy your cookout and gossip mingle with your friends. PLAN OF ACTION: The day of, start the marinade early, cut up veggies, make the avocado ranch and salsa. For some fun drinks that go with the theme, try some of my tasty skinny drinks. 1. Slice chicken in bite sized chunks. Skewer and set aside in fridge. Make sure to keep raw chicken away from any veggies. 3. Start chicken on the grill first. Add seasoning, if desired. Sprinkle with chopped green onions. Once you put them on the grill, try not to move them too much! 4. Add veggies to grill. In the last 2-3 minutes, grill tortillas until slightly crisp. 5. 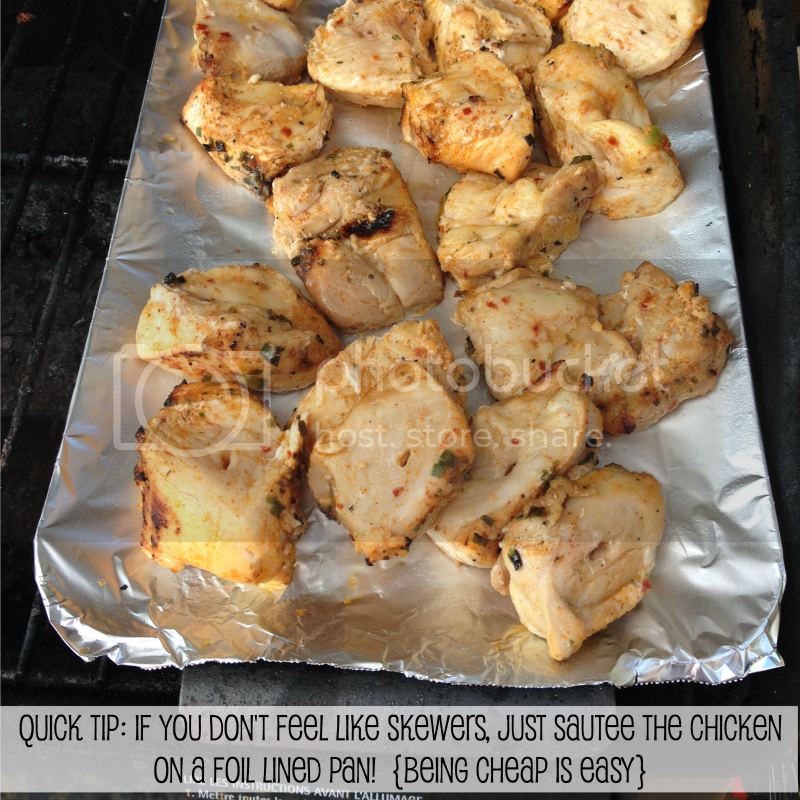 TIP: if you don’t feel like skewering the chicken, line a cookie sheet with foil and grill chicken chunks. (see photo). 6. Place all grilled food on the table with condiments and ENJOY! What’s your favorite food to grill for the 4th of July?